The Reichstag reflects the long and sometimes tumultuous political and parliamentary history of Germany. 1894 Inauguration of the Reichstag. The German Empire was founded after the victory over France in 1871 and needed a parliament to house the Imperial Diet. Architect Paul Wallot designed the building that resembled a Renaissance palace. 1916 During WWI, the inscription "DEM DEUTSCHEN VOLKE" ("TO THE GERMAN PEOPLE") was placed at the top of the portico, the main entrance on the western side. The bronze letters of the inscription were cast from melted French cannons seized in the Franco-Prussian War of 1813-1815. 1933 The Reichstag fire: Hitler came to power on 30 January 1933. Four weeks later, on 27 February 1933, a fire gutted the building due to arson. The circumstances of the fire were and remain unclear till today, but Hitler accused the Communists and subsequently used the fire as a pretext to ban all other parties, from now on, until the end of World War II, Germany was a Nazi dictatorship. 1945 The building lay in ruins with the Soviet flag raised at the top of the Reichstag following Germany's unconditional surrender. 1973 Completion of the reconstruction of the building in a restrained form and without a dome, it was predominantly used as a museum of German history during the years of German division. 1999 Following the fall of the Berlin Wall in 1989 and the ensuing German reunification in 1990, the seat of parliament was relocated from Bonn to Berlin in 1991, the government eventually resumed work at the completely refurbished Reichstag with the new glass dome on September 1, 1999. Today, the Reichstag building houses the German Bundestag (the Federal Assembly). The Reichstag has been the backdrop for many historic events and defining moments in German history, the Reichstag fire in 1933, the Soviet flag raised at the top of the building in 1945, the celebration of German reunification in 1990, these images are deeply inscribed into the country's collective memory. 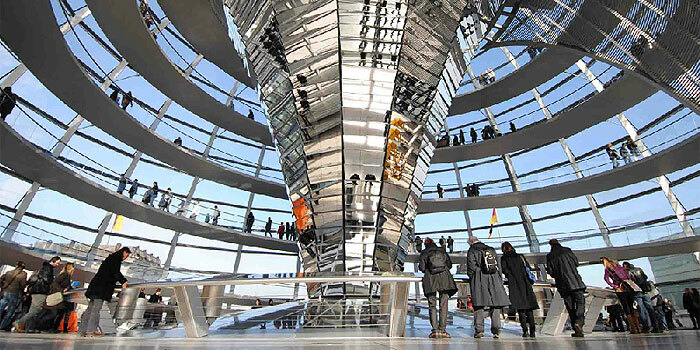 In 1992, British architect Lord Norman Foster won an international architectural competition and was awarded the project of redesigning the Reichstag. Transparency and openness to the world were the architect's benchmark principles when he started the transformation of the building which was to become a new symbol of Germany's democracy. Although he left the façade unchanged, he completely restructured the interior of the building and added a new glass dome. The clear subdivision of the Reichstag building into different levels combines historic architectural elements with a contemporary design and the construction of large open spaces follows the recent architectural trend that also fits a modern parliament which is open to the world. The basement and ground floor house the service department of the Parliament Secretariat and technical facilities. Above are the Plenary Hall and the visitor area, followed by the Presidential Floor and the rooms of the parliamentary groups, the roof is crowned by the impressive dome. The rooftop glass dome is one of the city's best-loved icons since opening in 1999 and a magnet for visitors. With great views of Berlin and into the plenary of the German assembly, it's no wonder Reichstag is the most visited parliament building in the world. The steel-and-glass structure weighs 8,000 tons, it is 38 meters in diameter and 23 meters high. At the center of the cupola, the funnel-shaped light sculpture, an inverted cone consisting of 360 mirrors, directs natural light into the Plenary Chamber and, at the same time, exhaust air is sucked up from the Chamber and released through a venting pipe to the air outlet at the top of the observation desk. A large computer-controlled sun shield follows automatically the movement of the sun thus preventing the reflection of sunlight. 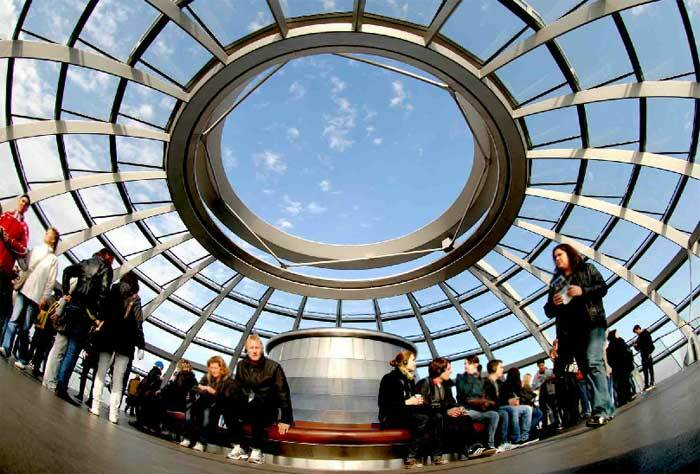 A spiral ramp leads visitors to the observation desk at the top of the building with a gorgeous 360-degree view of Berlin's cityscape. Especially at night, the illuminated cupola of the Reichstag has become one of the new architectural landmarks in Berlin. Lord Norman Foster, one of the leading representatives of high-tech architecture, not only converted the traditional building into a modern parliament, but also set new standards of efficiency and environmental protection. He had to comply with Germany's environmental protection requirements which are one of the strictest in the world. The cutting-edge technology of the architect's redesign masterplan also set new benchmarks in sustainability and energy saving. Norman Foster drew up a zero energy building with a positive energy balance, i.e. the Reichstag produces more energy than it uses for running the building's technical systems. Renewable bio-fuel is burnt for the production of electricity reducing considerably carbon dioxide emissions. Situated at the roof terrace, the restaurant "Käfer" is not only distinguished by its excellent location at the top of the German parliament, but also by its great food and elegant atmosphere. The view is as spectacular as its modern German cuisine. 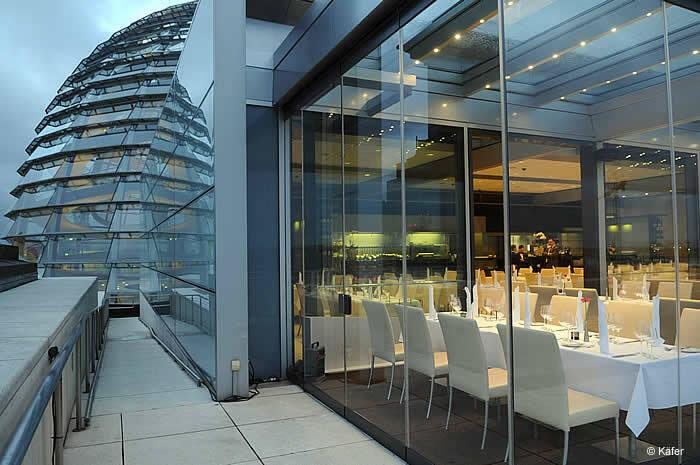 A good opportunity to enjoy a panoramic view of Berlin and a fine dining experience. A restaurant reservation includes free admission to the dome. The best things in life are free! 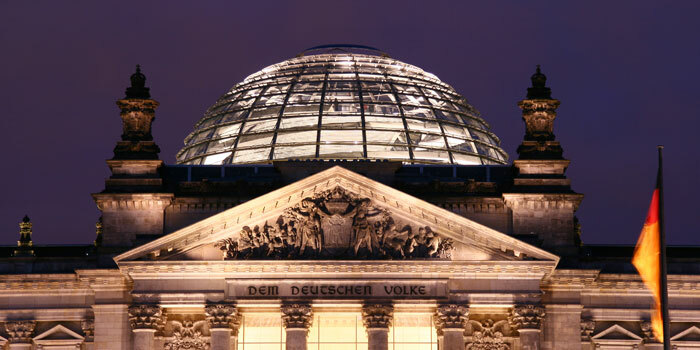 Visits to the Reichstag glass dome are free of charge, however, registration is required. Free headsets for a guided audio tour are available describing the views from various locations in many languages. Before entering the building you have to pass a security checkpoint with a metal detector and scanning equipment.